On our Bhutan Active Relaxation tour experience the Himalayan culture and lifestyle of Bhutan and enjoy gentle walks, hikes and rafting. Day 1: Arrival at Paro. The flight into Paro presents you with a wonderful view of Everest, Kanchenjunga and the peaks of the Eastern Himalayas. Your guide will be there to meet you at the airport and accompany you to your hotel. Welcome to Bhutan! After freshening up and having lunch, visit Paro Ta Dzong Museum and descend on foot to the impressive Rinpung Dzong. Finally, stroll across the traditional bridge into Paro town, where you can enjoy some free time at leisure in the town. Dinner at the hotel. Drive to Punakha. On the way stop at Dochula pass (3000m) to enjoy the view of the mountain ranges and the 108 chorten that are situated right at the top of the pass. Then descend to Punakha at 1,200m. For hikers we plan to take you on a 3-hour round-trip hike with a picnic lunch starting at the Dochula Pass. Or you can opt for a more gentle village walk of 2 hours or 4 hours duration with a picnic lunch. For dedicated cyclists, we include mountain bike hire for 2 or 4 days, with dedicated support so that you can take a hop-on-hop off approach and test your limits in the Himalayas. In Bhutan, you would use your mountain bikes on the main tarmac roads as well as on rough farm tracks. There are hardly any dedicated off-road mountain-bike tracks. Sightseeing includes Chimi Lhakhang, the temple of the “Divine Madman” and Punakha Dzong. Today’s options include rafting on the Punatsangchu river, hiking to Khamsum Yulley Namgay Chorten and cycling in the Punakha area. A driving and hiking excursion to Talo monastery is also an option. Drive from Punakha to Wangdue and wind your way all the way to Phobjikha, a wide, high glacial valley with an area of marshland that is a nature reserve. Sightseeing includes a visit to Gangtey Monastery. Settle in to your hotel and relax this afternoon. Phobjikha is ideal for taking gentle walks in nature. 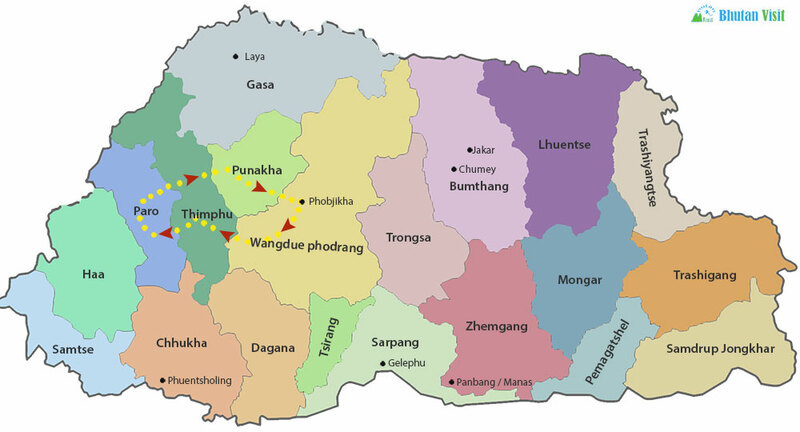 In this tour you will spend most of the day in Phobjikha, returning to Wangdue for the night. Today’s activities include cycling, hiking and visiting a farmhouse, where they will include you in some of their daily activities and serve up a typical Bhutanese lunch. In the afternoon, set out on the return drive to Wangdue. The drive back to Thimphu gets you there in time for lunch. Stretch your legs on a short 50 minute – round trip hike to Wangditse temple or a more energetic 2-hour uphill hike to Chokortse temple and get some nice views looking down on the Thimphu dzong. Alternatively, try your hand at archery, with a Bhutanese expert to show you how. Sightseeing includes Chang-gangkha temple, the huge open-air Buddha statue, the Takin reserve (the takin is the national animal of Bhutan) and the viewpoint, festooned with prayer flags. End the day with a visit to Thimphu Dzong (Trashichodzong). Dinner in a restaurant in town. After breakfast, drive to Paro. Cycle or drive to Drugyel Dzong, or take a village walking tour. Also visit Kichu Lakhang, one of the oldest temples in Bhutan, with a history and legend linking it to the wider world of Buddhism. Dinner at the hotel. Today take an early morning hike up to Taktsang Monastery, perched on the edge of a steep cliff. This is a highlight of the tour. The round trip takes about 4 hours.Return to the base for lunch at a 5-star hotel and a one-hour steam and sauna session at a 5-star resort hotel. Free time for browsing in Paro town. Dinner at your hotel. Transfer to the airport for flight departure from Paro. Tashi Delek!